Project Organizers can upload drawings from the web app using either the Fieldlens Drawings Uploader App, the PDF uploader, or syncing them directly from Bluebeam Studio Prime. These options can all be accessed via the Drawings tab at the top of the Fieldlens web app. If you’re not a Bluebeam Studio Prime user we recommend using the Fieldlens Drawings Uploader for large sets or when many revisions are expected. It’s a downloadable desktop application available on PC or Mac that allows for more seamless syncing of your drawings. Using the Fieldlens Drawings Uploader will also preserve any links or annotation you’ve created in a PDF editing software. Once downloaded, simply log into the Fieldlens Drawings Uploader using your Fieldlens credentials and select a project. The only projects visible to you will be ones on which you are the Project Organizer. You can add new drawings by clicking +New Folder. The folders that you specify will be linked to the Fieldlens Uploader so that when you add new plans or revisions to that folder you can simply open the Drawings Uploader. It will recognize any changes. You can also use the Basic Uploader to select files or drag and drop them to directly upload, similar to attaching photos to an email. 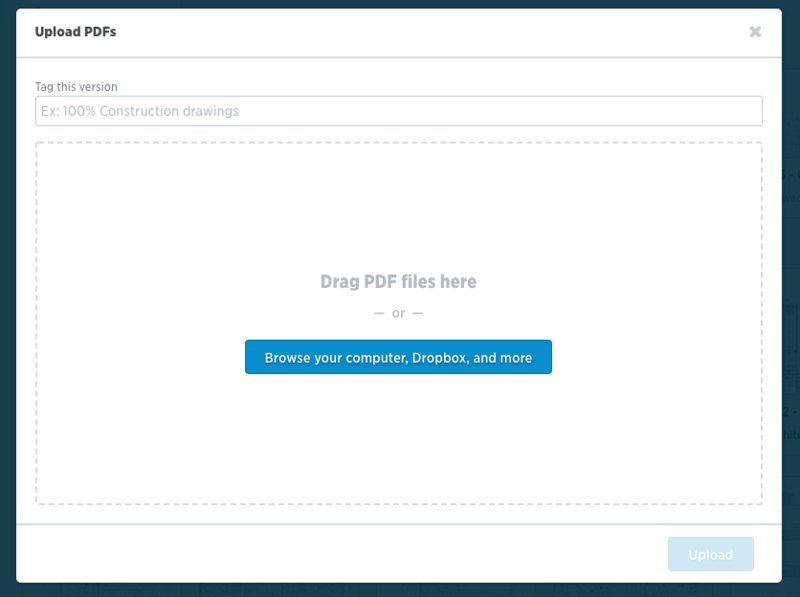 The Basic Uploader is perfect for single drawings, smaller sets, or sets contained in a single multi-page PDF. This web uploader requires no additional software, and like the desktop uploader, it will recognize links created between separate PDF files. Once you’ve selected and uploaded your files (or dragged and dropped them), you must create or select a Drawing Tag to upload and process your drawing. Connect your Bluebeam Studio Prime account to sync drawings directly to Fieldlens, links and all. Once connected, Fieldlens will keep an eye on your Bluebeam files for changes and let you know when it’s time to sync. Drawing files uploaded to Fieldlens may take a few minutes to process. Generally this is extremely fast - but during periods of high activity there may be delays. Click the drop-down menu on the View Uploads button to view your Processing Queue. Use the drop-down on the upper left of the popup to see if the files are still processing, have been uploaded, or if there was an error. If you do find that your drawings are taking an excessively long time to process, please reach out to our coaches at [email protected] or use the in-app help chat. Fieldlens sets the plan number and name automatically - the plan number and name is based on the information in the title box on the drawing. The title box will also inform us of the Discipline by using industry-standard designators. For example, “A-101” will have Architecture as a Discipline and “E-101” will be assigned as Electrical. While this works for most PDF files, you should still double-check names and numbers for accuracy. All of your drawings are here until you publish them to the project. Fieldlens lets you review the uploader to make sure the drawing names, numbers, disciplines, etc are set up the way you want. You can scan the individual drawing yourself if the processor has a hard time finding the name and number. You can pick where the processor pulls the drawing number and name from if the title block isn't in the bottom right hand corner or the processor has trouble find the right information. Once they’re uploaded and processed, you can view your drawings on the web or mobile app. Drawings can be viewed within a Fieldlens project by navigating to the Drawings library from the top of the web app or the menu on the bottom right for mobile devices. Revisions, however, will have to be approved before becoming available to your users. A grey check box indicates the drawing is on your mobile device and is the latest version. A green arrow means the drawing has not been downloaded. If a drawing is marked red, it is out of date and a newer version is available.